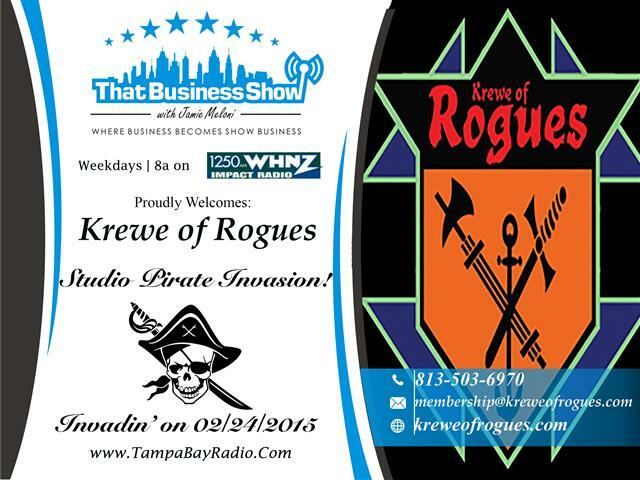 Today the studio was invited by two pirates from The Krewe of Rogues. Captain Dave Varrieur and the Bling Bling Pirate Jean Mark Wallace joined me in studio today in full pirate gear to discuss their Krewe as well as the history of Gasparilla. It was a very fun show and highly entertaining. The Krewe of Rogues is the only Krewe that offers an a-la-carte membership meaning that people that want to participate in one of the 4 annual Gasparilla season parades can pay a one time fee and attend and get to ride on the float. In addition, the Krewe provides beads, no other Krewe’s provide that tremendous benefit. Jean Mark Wallace also spoke of his wedding which occurred this year at Gasparilla and was the first time that was allowed. Dave provided insight into the history of the Krewe and Gasparilla and we wrapped up by discussing what they do when they are not being Pirates. Dave is a certified appraiser and owner of Accurate Appraisal Services and can be reached at 813-503-6970 or email at appraiserfl@outlook.com for all your appraisal needs. Jean Mark Wallace works with Quality Roofing in sales and you can learn more about Mark and Quality Roofing by reaching out to him at jmarkwallace@Verizon.net or phone at 813-626-1461. Learn more about the Krewe of Rogues at http://www.kreweofrogues.com!